Dan Westwood – 17th and 18th of the season for the goal machine. 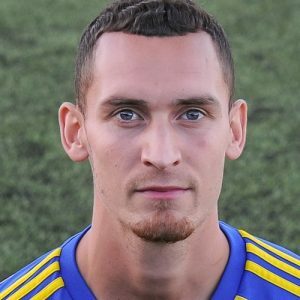 Goal machine Dan Westwood’s 17thand 18thgoals of the season lifted a scrappy encounter from the doldrums and helped Sporting Khalsa regain fourth spot in the Midland Football League. A testing surface and a pre-match downpour did little to help conditions as Coventry – beaten twice by Khalsa last season – set about trying to put the record straight. An early chance presented itself for the home side after just three minutes to Joe Cairns who fired a dipping shot just over Sam Arnold’s crossbar while at the other end on 12 minutes, a great block by United’s Ronee Hendrick denied Dave Meese after good work on the flank by Rico Taylor. The game settled into a pattern of quite ugly slogging, both sides seeking to gain a physical advantage over the other while Khalsa’s defensive ranks absolutely solid and debutant Adam Osbourne particularly assured. The fantastic foursome at the back put on a masterclass in utilising the offside trap with United strikers caught out time and time again. Arnold pulled off a good stop to deny Cairns on the half volley on 34 minutes as it appeared Coventry were just settling into a bit of rhythm. It was Khalsa who finished the half stronger, however. Mensah Kinch fed Westwood on 41 minutes but the striker was forced wide and hooked his effort hopelessly over and then the impressive Jamal Clarke produced a really good block to deny the same player after being fed by Lee Chilton on 44 minutes. In first half stoppage Coventry might have taken the lead, Clarke’s header from Arum Soleman’s cross was deflected wide and from the resulting corner Curvin Ellis’s acrobatics forced a routine save from Arnold. With Coventry having just edged the first half, on balance, the second half undoubtedly belonged to the visitors. The first really clear cut opportunity arrived at the foot of Westwood on 52 minutes after good play by Meese but the effort was blazed over. Leon Miles wasted a great chance on 61 minutes, heading tamely wide from Chilton’s corner with absolutely nobody near him. But this was all forgotten on 63 minutes when Chilton’s magic down the left put the ball on a plate for Westwood to open the scoring in incredibly simple fashion. Coventry offered little in terms of fightback, or certainly nothing Khalsa’s defensive ranks were unable to absorb quite comfortably. And the game was wrapped up on 86 minutes, Chilton again on the left fizzing in a cross for Westwood to volley home and seal three really important points for Ian Rowe’s men. Sporting Khalsa: Sam Arnold, Carlo Franco, Adam Osbourne, Leon Miles, Tes Robinson, Alex Woodhouse (Alex Perry), Mensah Kinch (Vidal Hendrickson), Rico Taylor (Liam Armstrong), Dave Meese, Lee Chilton, Dan Westwood. Subs not used: Shawn Boothe, Josh Thomas.